"In an effort to protect our environment and the rights of those living in it, River Whyless has created a specific line of merchandise that gives voice to these issues. To help uphold the civil liberties granted to everyone by the U.S. Constitution, we are donating a portion of this revenue to the American Civil Liberties Union. Additionally, to help protect ourselves and the environment from climate change, deregulation, oil drilling, and pollution, we are also donating a portion of this revenue to the National Resources Defense Council. 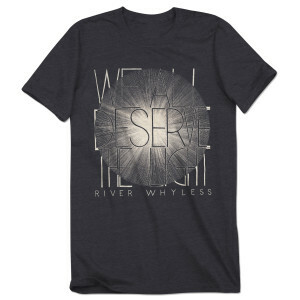 By purchasing a “We All Deserve the Light” t-shirt, you are helping to spread a message of peace, freedom, and inclusivity, as well as partnering with River Whyless as we attempt to uphold the rights and values that have always been at the core of our democracy. "